“Happiness does not come from doing easy work but from the afterglow of satisfaction that comes after the achievement of a difficult task that demanded our best.” – Theodore Isaac Rubin. Over the years I’ve come across many people who have resisted taking a leap of faith to something new despite being deeply unhappy with their current position. Some hated their jobs, others were bored with their career and some were unhappy in their relationship. Others felt that life was passing them by and were generally bored and stuck in a rut. In such circumstances I ask people why they are putting up with a situation and something that isn’t bringing them happiness. I seek to get to the heart of what is stopping them from moving out of their comfort zone (or in some cases discomfort zone) and taking a leap of faith. Many respond by saying something along the lines of “better the devil you know” or that they are afraid of changing the status quo. The main reasons that people stay stuck and procrastinate tend to be because of a strong sense of responsibility to others, fear of failure and the unknown. In many cases, people underestimate their capabilities. It’s quite common that people who have been in a job for a long time become institutionalized. They begin to think that they aren’t capable of doing something else. I’ve seen many instances of people staying in a job that they detested because they didn’t have the confidence to do something else. However, some of them got made redundant and this forced them to take action. A fresh set of circumstances had been presented to them and they had to step up. It gave them the opportunity to do something new. In doing so, they found alternative employment that brought them greater satisfaction and fulfilment. They also discovered hidden strengths and talents. As well as fear, limiting beliefs and negative thinking can get in our way and stop us being all that we can be. Our brains sometimes don’t help us positively, as they are designed to keep us safe and comfortable. On occasions they make us risk averse and encourage us to play safe. Past setbacks and disappointments can keep us stuck in our comfort zone as we start to doubt our capabilities. It can mean that we don’t feel resourceful enough to cope with the demands of changed circumstances. We also can be fearful of repeating past mistakes. Procrastination and the need for perfectionism can stop us fulfilling our potential. Many people worry about making the wrong decision. However, what’s more worrying is that some fail to make a decision and keep going over the same ground mentally. In doing this they expend lots of valuable time and energy. We sometimes stick with what we know because we like to know in advance what the outcome of our decisions and choices will be. Unfortunately life doesn’t come with guarantees. There is a famous phrase “that if you leap the net will appear” and this can inspire us to take a leap of faith when we’re contemplating change. If we listen to our hearts, have done our planning and know that the change is the right course of action for us, then a magic seems to happen. It’s incredible that when we fully commit to action, believe in a positive outcome and set our mind to succeed, the world has a knack of conspiring to support us. We can all learn something from artists who have to give up the need to know the outcome of a particular project when they start out and instead fully embrace the creative process and trust where it takes them. It’s a bit like viewing life as an adventure and enjoying the journey. By staying in our comfort zone, we don’t discover our true self, our hidden depths and potential. We also fail to experience all that life has to offer. We can all remain in our comfort zone and spend time wishing and dreaming of a better life. Alternatively, we can take a leap into the unknown and create our own version of how we want our life to look. It’s worth reminding ourselves when we feel stuck, that a ship in harbour is safe but that’s not what ships were built for. If you feel like you are stuck in a rut and want to change things, start by making small adjustments to your daily routine. You can decide to visit new places and go to events that you wouldn’t normally go to. You can choose to read new books, watch different TV programmes or make a commitment to meet new people. Break any big goals that you have into achievable baby steps so it’s easier to start and sustain effort. 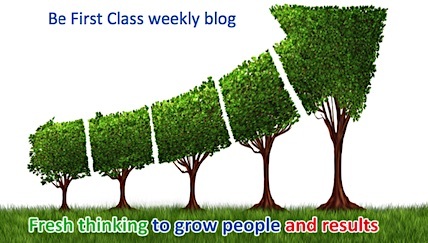 As I stated last week’s blog small consistent actions lead to outstanding results. You may have a dream to visit a new country, write a book, change job, start a new business, begin a new hobby or learn a new skill. Whatever your particular dream is, remember that you are the artist of your own life, so use your thoughts wisely. Be very clear and intentional about the life that you wish to create. This will give you a clear sense of direction and purpose. This week, why not take a few moments out to reflect and be honest with yourself. Consider if there is anything you may be resisting or if you are afraid to take a leap of faith. Ask yourself “What would I start if I knew that things would work out positively? Is there a step you can take this week to start to change something positively?